Every now and then Windows operating system shows blue screen of death which indicates that a critical error has occurred and Windows can no longer work safely. Every BSOD displayed with the error code name, one of the most common blue screen bug check is kernel security check failure with a value 0x00000139. 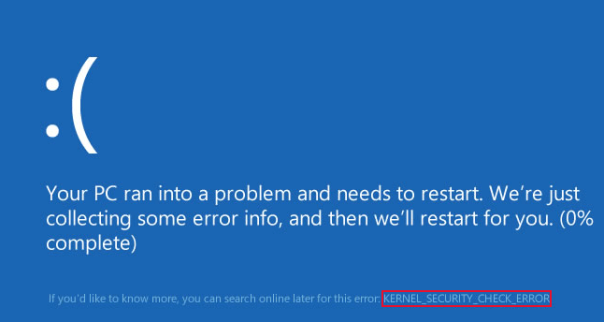 Besides, this stop error indicates that there is a data structure corruption which has been detected by the kernel. In this post, I will shed some light on this bug check, its causes and possible resolutions. Stop error 0X139 is most frequently occur in Windows 10, Win 7, Windows server 2012 R2, server 2012. To resolve the bug check, go through the below methods. Perform Windows Update and Driver Update: Updating all drivers can solve your problem since it can resolve incompatibility of a driver with Windows operating system. Furthermore, to resolve the issue, make sure Windows Update has been performed. Uninstall Faulty Drivers: One of the main reason behind Kernel Security Check Failure blue screen is faulty drivers. The issue can be solved by removing yellow signed drives from device manager. If faulty drivers cannot be identified then run Driver Verifier, it will list defective drivers in BSOD.